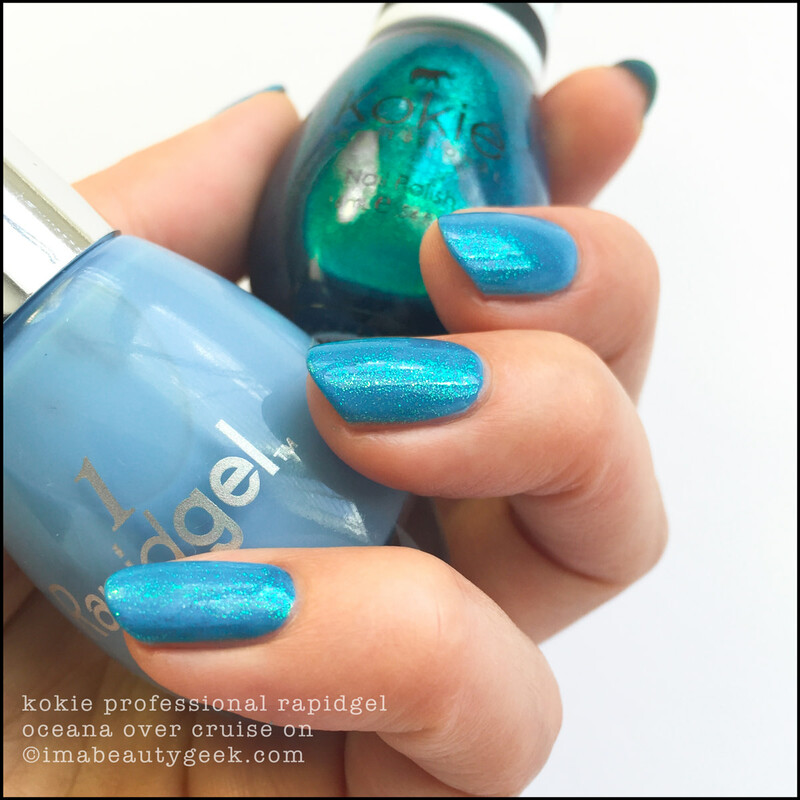 From the founder of Sinful Colors comes a new brand of polish – let’s look! And note: you need to consider this line on its own merits. Hiya friends! 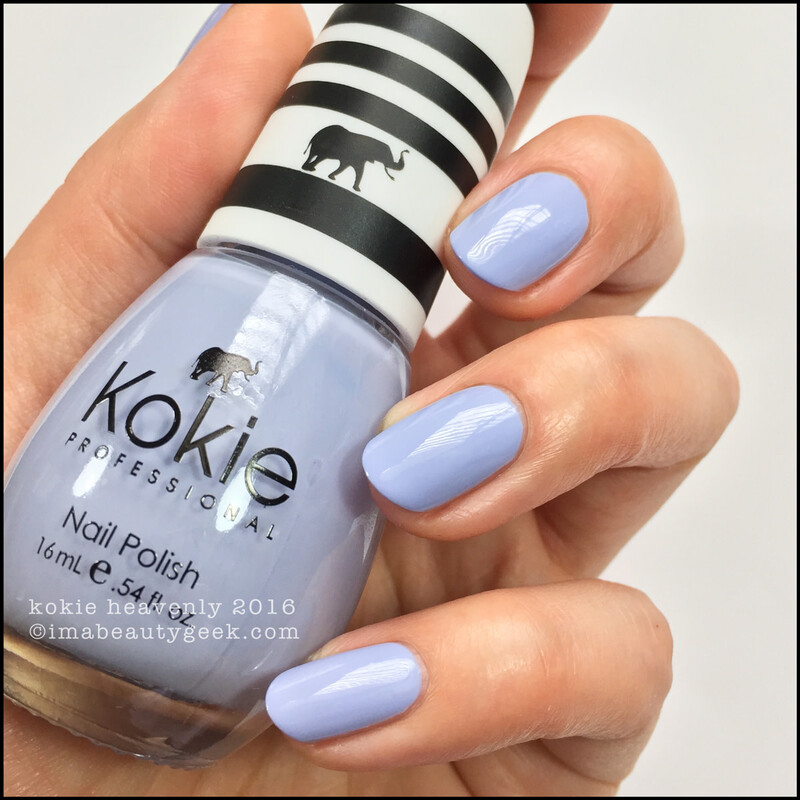 It’s just me again and I’ve been playing in a new brand of polish called Kokie Cosmetics (pronounced Co-Key). There are two lines of polish. Both are 3-free and cruelty-free. 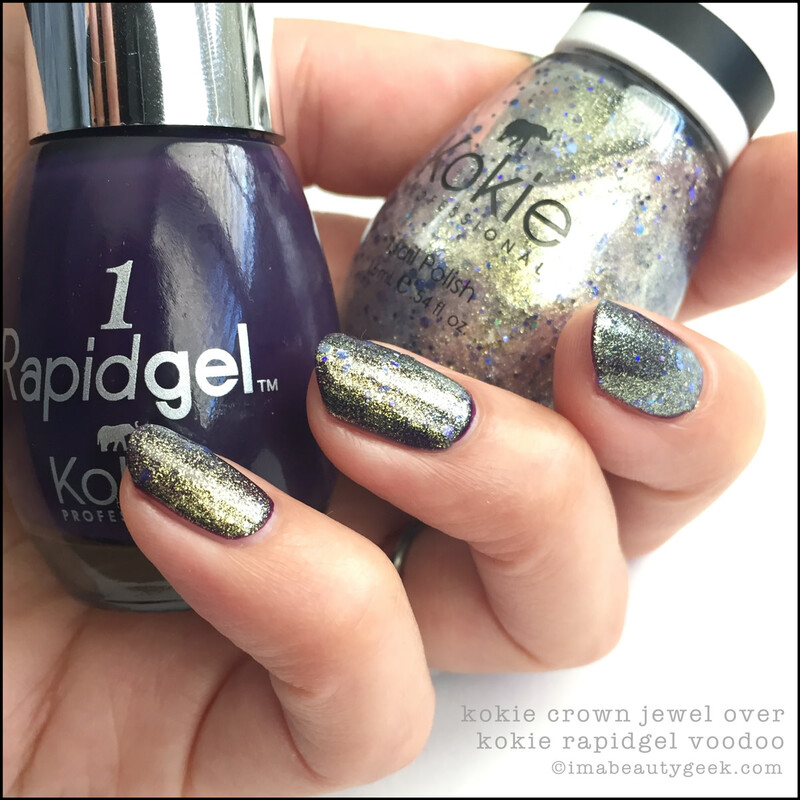 The wear claim for the regular polish line ($6) is up to 5 days and the wear claim for Rapidgel ($7 and not gel) is 7 days. I’m jamming them all in here together because hey, they’re all Kokie! 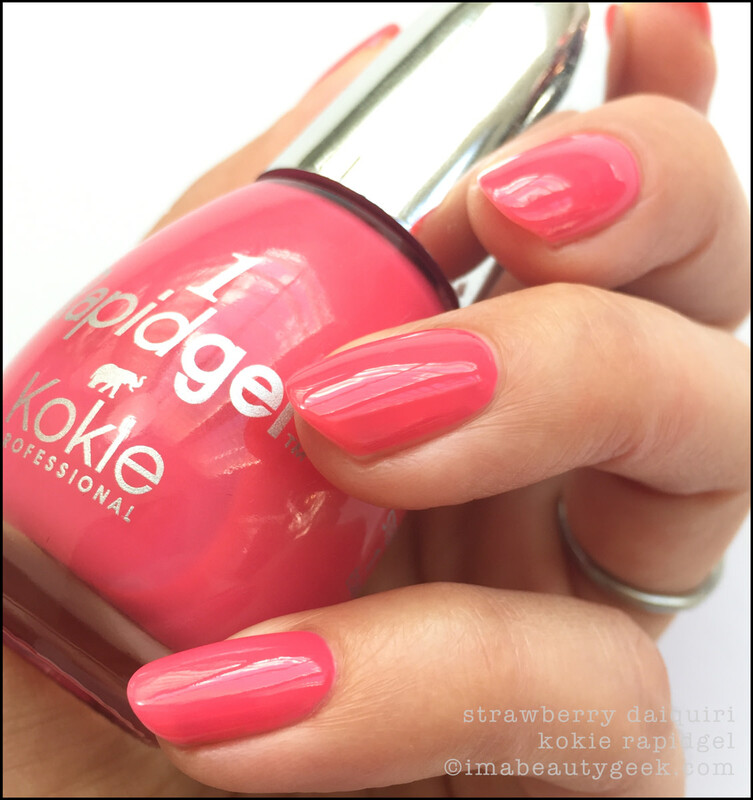 Kokie Strawberry Daiquiri – Rapidgel (above). That’s 2 coats and I found the consistency a tiny bit watery. Could it have used 3? Sure, especially if you do thin coats like I do. Why didn’t I do 3? Because I’m lazy. Kokie Sparkle Send Off over Strawberry Daiquiri Rapidgel (above). Sometimes I do things and don’t really know how I feel about them. I’m still undecided on this combo, but I tell ya what: if you’re looking at the glitter and thinking you’ve seen it somewhere before, it’s probably because you have. MAC Quick Million, anyone? Kokie Firecracker – Rapidgel (above). I can’t seem to get great control with this stuff. It just feels a little too thin for my style of polishin’ and that’s on me. Here’s Firecracker in 2 slightly patchy coats. For me to do 3 is too much to ask from a shade that’s this widely produced (and do-able in 2) by pretty much every polish company out there. Kokie Razzle Dazzle (above). That’s 2 quick coats and the formula here is stellar. The saturation and depth of colour they got with this shimmer is amazeballz. She’s perfect for the holiday season! Also, she’ll get your cuticles, but you knew that on account of the redness. Kokie Heavenly (above). She&apos;s a real purdy cornflower lilac crème in 2 coats. It’s gonna look so good when I’m sporting my navy cashmere sweater! And you know what else, I don’t think I have a perfect dupe for it. 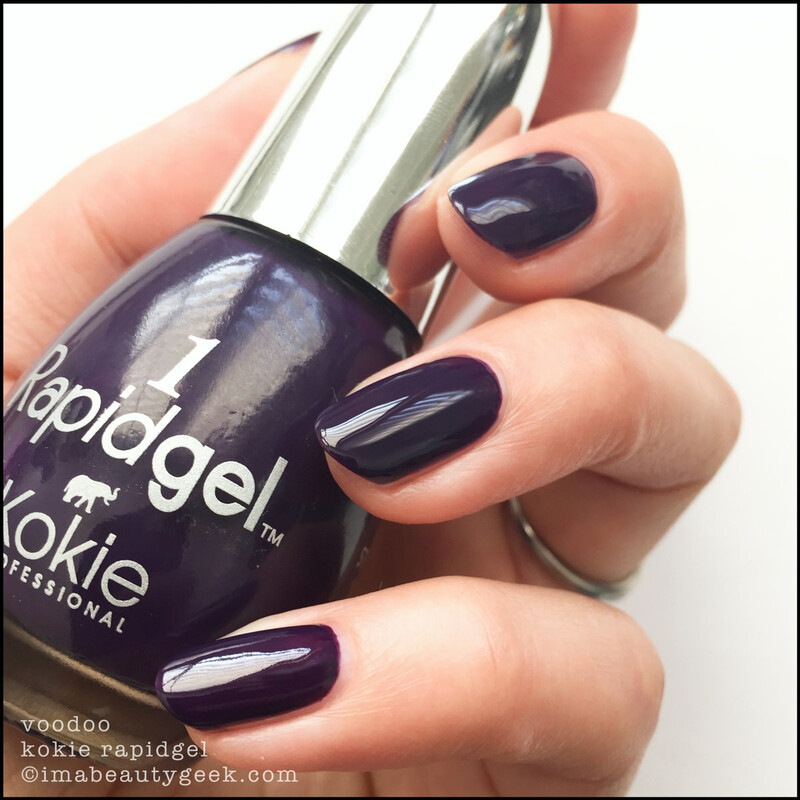 Kokie Cruise On – Rapidgel (above). 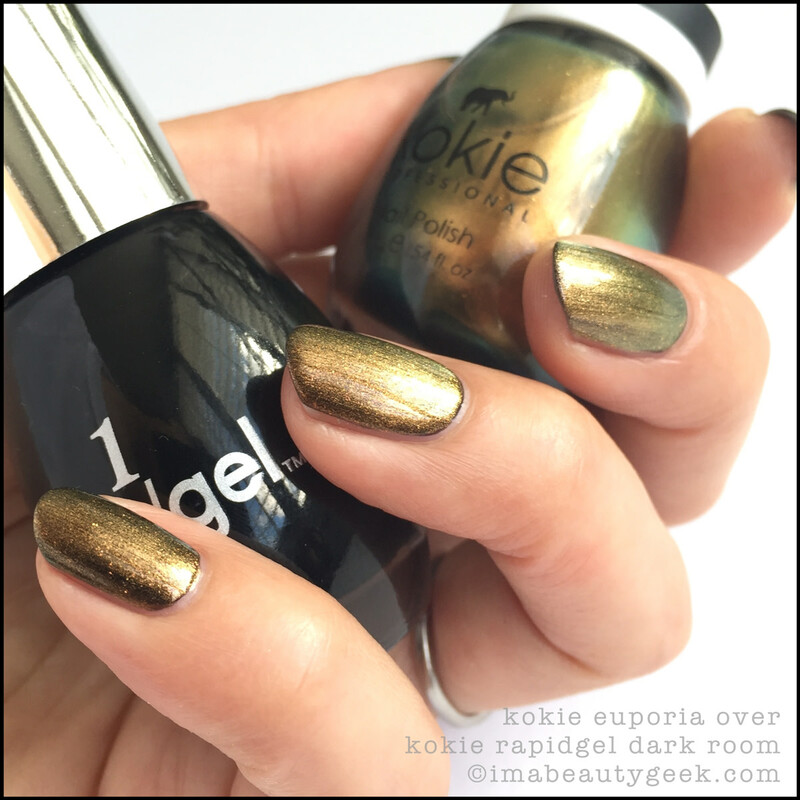 This was the first bottle of Kokie Cosmetics nail polish I tried. It has instructions on the back! It says “Apply two coats and let dry.” I did 3. Again, the formula is thin and wants very much to migrate (like it did on my pinky finger) so for best control, don’t overload your brush. Kokie Oceana over Kokie Cruise On (above). Huh. This is waaay more awesome than I thought it would be! Like A+ kinds of awesome. 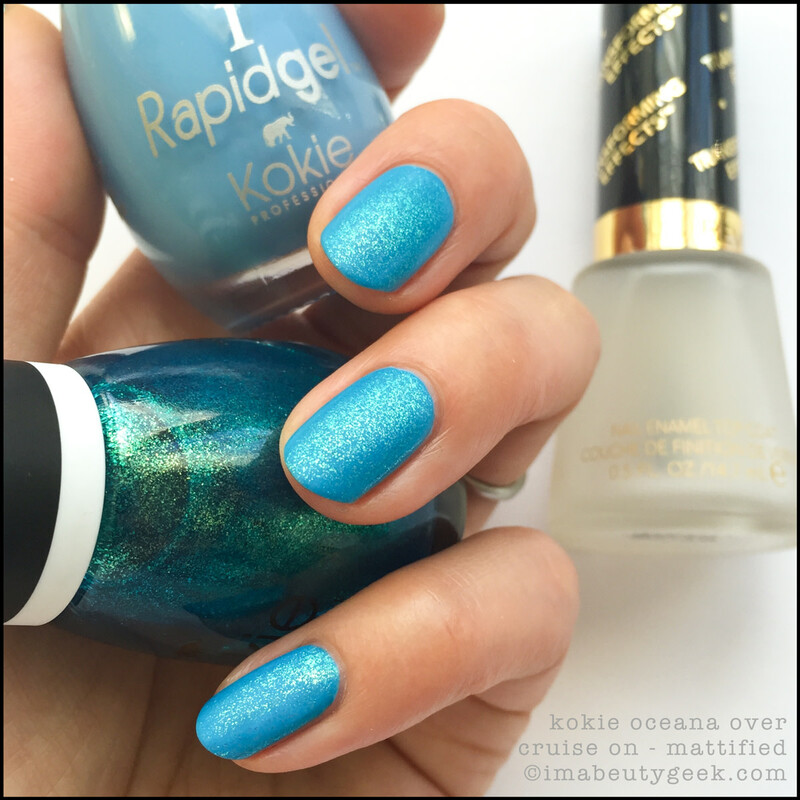 The shimmer payoff in one coat of Oceana is whack! There’s a phenomenal icy-bright look to it. I’d buy this. Just sayin’. 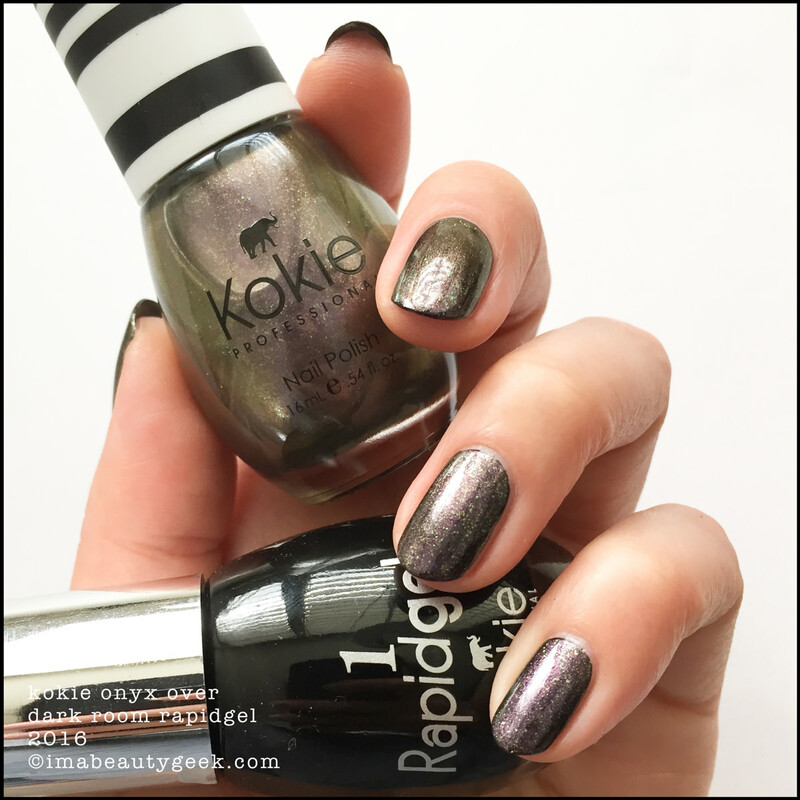 Kokie Oceana over Cruise On – mattified (above). Some of you aren’t going to like where I took this but I loves it! It’s matte but look how much brightness it has! It’s so confusing to my brainz that I can’t stop staring at it. I know, I gots problems. 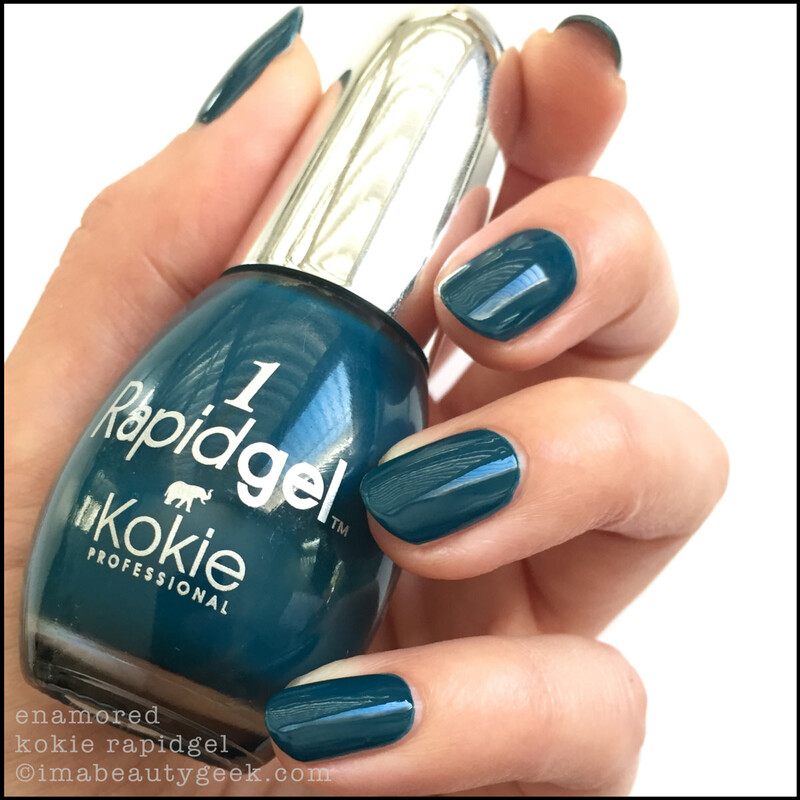 Kokie Enamored Nail Polish – Rapidgel (above). By now you’ve been looking at the swatches and thinking you’ve seen all of these shades before. Mostly, that’s because you have. Here, enjoy this shiny, 2-coat, more-green-than-blue teal. Oh, and please enjoy it with a base coat and don’t twist when you remove. You know what I’m talkin’ ‘bout, right? 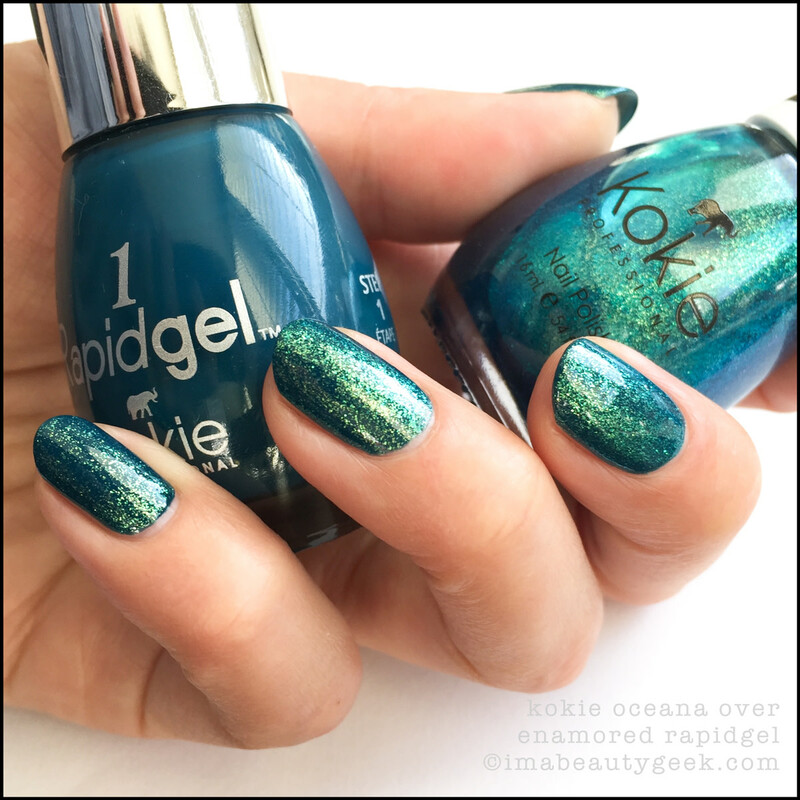 Kokie Oceana over Kokie Enamored Rapidgel (above). Look at that. Just look at it. Now do you see why I’d buy me a bottle of Oceana? That’s 1 coat over Enamored. Stunner. 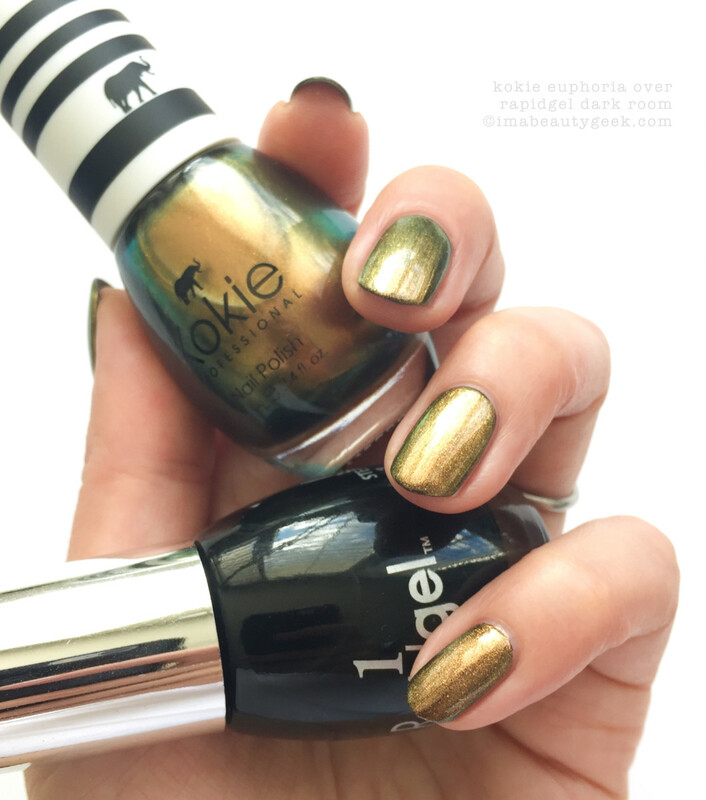 Kokie Onyx Nail Polish (above). Hey! Look at those 3 coats of fleck-y duochrome-y magic! She reminds me an awful lot of OPI’s Not Like the Movies and she also reminds me an awful lot of OPI’s Next Stop… The Bikini Zone. She’s a little more grey and a little less lilac than either of those two, so… similar, but not the same. Kokie Onyx over Dark Room Rapidgel (above). Yes, I don’t just have mattifying issues, I have layering issues. If I can layer something, odds are I’m going to try! Good thing too, otherwise you’d have no idea you could take your bottle of Onyx and turn it into this. 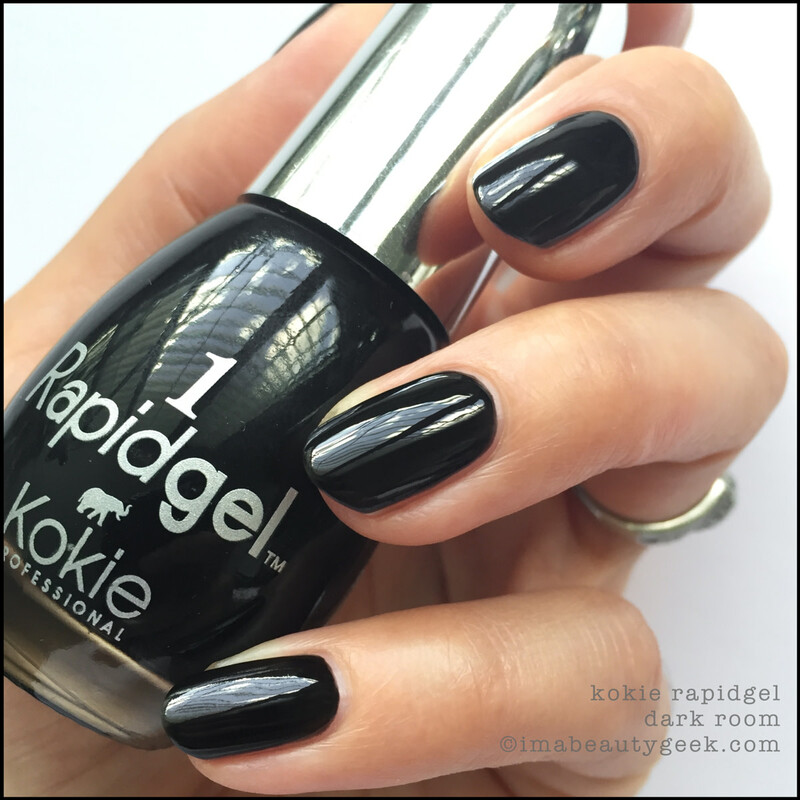 Kokie Dark Room – Rapidgel (above). But wait – I gotta talk about the black too! 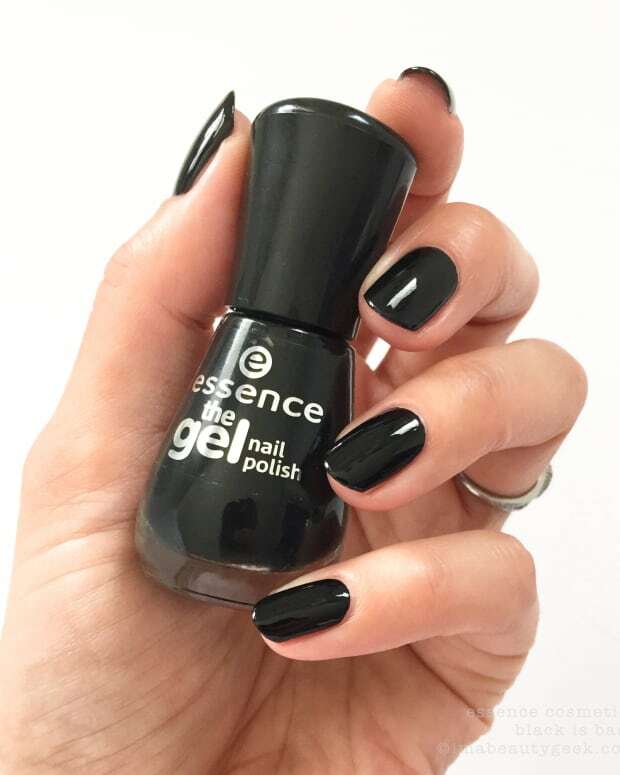 It’s 2 simple coats of black crème. Not bad, but not an OCW either. Kokie Euphoria over Dark Room Rapidgel (above). I slapped 1 coat of Euphoria over black and let me just guess what you’re thinking… Peridot? Nope. It’s not the same as Peridot or any of the Peridot dupes – it leans more toward orangey-copper-gold than the greeny-gold of Peridot. 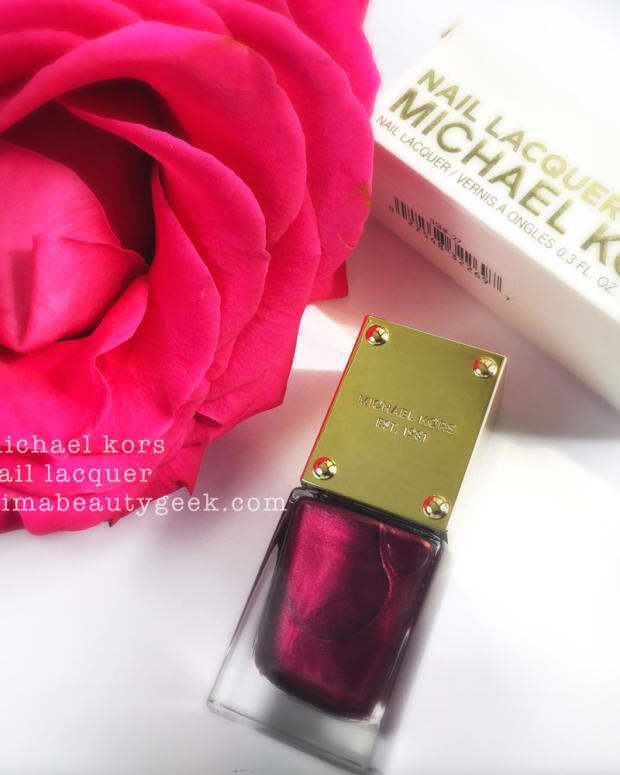 It IS similar to Sephora by OPI S-age is Just a Number, but this pretty Kokie has more flecks. Can you wear it alone? Sure, why not? Here, lemme show you! 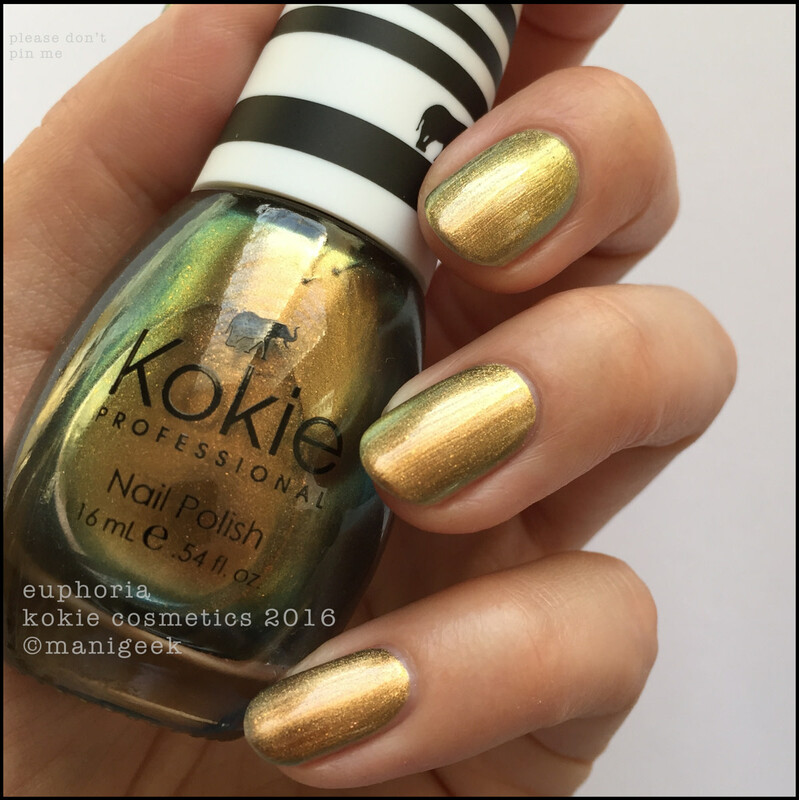 Kokie Euphoria (above). In 3 coats (and nice natural light), you get this golden green, fleck-y duochrome shifter. 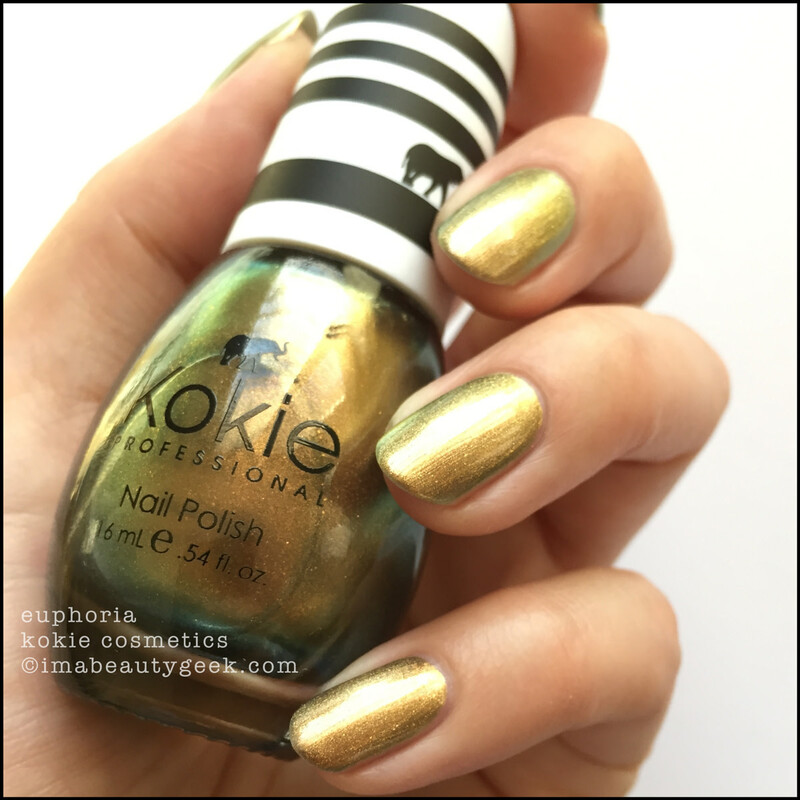 Kokie Euphoria (above). And here’s the same mani in mucho lower natural light. Duos always look so much more shifty-cool in low light. I’d buy this. Yes, I would. Does it matter that I have similars in The Archives already? Nope, I still wannit. Kokie Voodoo Rapidgel (above). Boy I really failed in my note-taking on this one. I must have been too busy oggling the perfect blackened grape nails I’d just made. That’s 2 coats and it’s got really great shine all by itself. There’s just something about a simple dark purple that to me, always looks sophisticated. I dig it. Kokie Crown Jewel over Kokie Voodoo Rapidgel (above). Also, you can use dark purples as bases for things like Essie’s On a Silver Platter. Oh… My bad. I meant things like Kokie’s Crown Jewel! Could you wear your Crown Jewel by itself? Sure. Would I? Nope. How come? Well because I’ve already used On a Silver Platter by itself and I didn’t love that so… yeah, I’ma layer it. Kokie Bewitching (above). I have nuthin’ but love for dark fleck-tastical purple things. They’re like crack. I mean I already have very similar (read 90% dupe-tastic) shades in China Glaze Rendezvous With You, JinSoon Farrago, and the newer ColorClub The Uptown, but hey, the more the merrier! I will have all the fleck-y purple things! And that’s it! Oh. Wait. That’s not it. I gotta give you the back story! I’ll nutshell it for you though because I’m nice like that. Your nutshell: Somewhere around 20-ish years ago, Chris Chon created SinfulColors for Mirage Cosmetics. In 2011, Revlon bought Mirage. 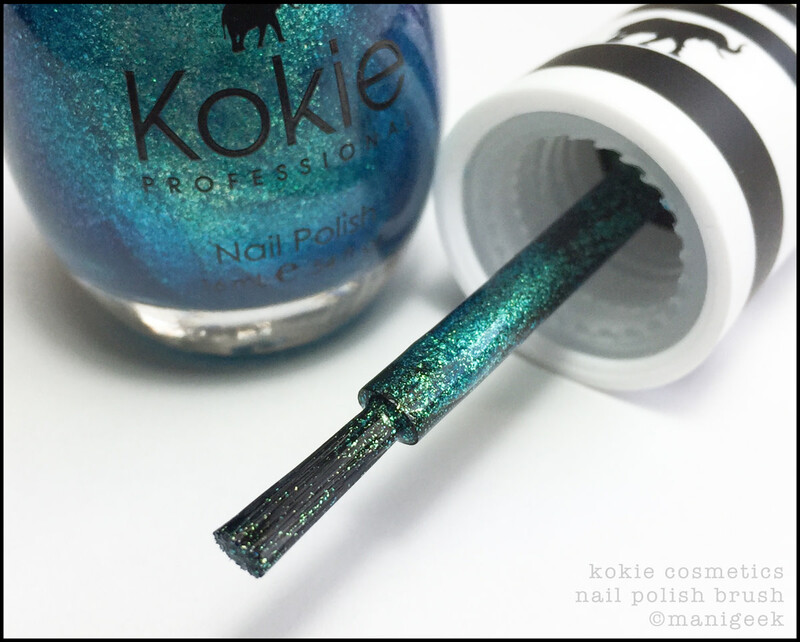 In 2015, Chris Chon (no longer with Mirage) founded a new line called Kokie Cosmetics. Here in late 2016, we’re looking at Kokie’s first media-blast. Is all this important to you as a nail polish consumer? Nope. Availability: US only. Booooo. In-store at Bed Bath & Beyond, Harmon, and Christmas Tree stores. It’s also available at harmondiscount.com. Word on the street is that starting Spring 2017, you’ll be able to score it in a US chain retail store. Do I know which one? Nope. If I find out though, I’ll letcha know. Oh! Right! One last thing – I swear it! What’s with the elephants? Here, let Kokie tell you.